Note: Some sources spell his surname as Thomson. Born in Morpeth, Northumberland in 1886, Thompson began his career with local side Grangemouth before joining Middlesbrough in 1905. He played six games for the "Boro, but despite scoring twice against Bolton Wanderers on his debut, soon returned to his hometown to play for Morpeth Harriers. He returned to League football with West Bromwich Albion in March 1908 and played more than 50 times for the club, scoring six goals over the next three years. In 1911 he returned to the North East with Sunderland, where he played only for the reserves, and also had a spell with Glasgow junior side Rutherglen Glencairn. 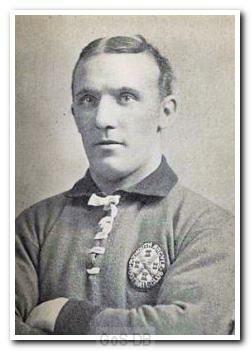 Described earlier in his career as an outside-right or inside-left, in May 1913 Thompson joined Argyle as a half-back. He could not find a regular place in the first team though, and left after the 1913-14 season, returning to the North East again, this time to join South Shields. He went on to play for Queens Park Rangers, Newport County, Hartlepools United and Jarrow.